Voisard Manufacturing, Inc. is a leading, full-service provider of quality metal fabrication products and services to the heavy-duty truck, environmental, construction, specialty vehicle, chemical, security, electrical and other specialty equipment industries. 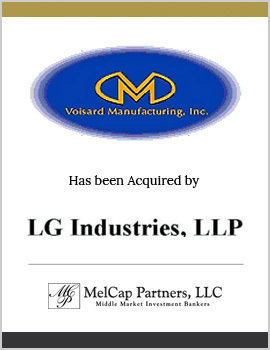 MelCap Partners acted as the sell-side advisor to Voisard Manufacturing. Voisard Manufacturing was successfully sold to LG Industries, a private acquisition group focused on acquiring niche oriented manufacturing businesses.